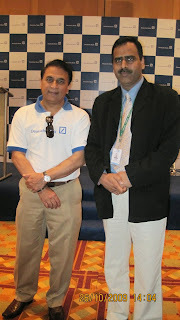 On Monday, 26th October'2009, I have had the privilege to interact and hear Mr. Sunil Gavaskar who is considered as one of the greatest opening batsmen in the sport's history, during a luncheon meeting organized by Deutsche Bank. Introductions are important - When it came to introduce Sunil, there was usual one liner, I don't think, Sunil need any introduction. This is where Mr. Gavaskar picked up and shared some of his earlier cricketing days when he was baby of the team and how he used to be introduced. He did share some of the example including how he was introduced during a ceremony after a spectacular test debut series in 1971 where his scoring 774 runs helped India win for the first time in the Caribbean against carribians. He emphasised that it is always great to do the introduction irrespective of the stature of dignitary and when it comes to upcoming cricketers and by that analogy to young business professional who is striving hard to get their place under the sun, it is imperative that introduction is done well and in style as they look up to it and derive motivation out of it. 3 D's - When asked what helped him achieve success. He said, "3 D's are primarily responsible for my success". And he defined 3 D's as Discipline, Dedication & Determination and he related this to his on field and off field life. Concentration is the key - Another key lesson came in when he shared that he has been blessed with the concentration and that is something which was instrumental in making him what he is today. All these learning's reflected in his determined approach even while facing the four-pronged fast bowling attack regarded as the most vicious in Test history that too, without a helmet. All in all, it was great to hear a legend and his success tips. May be of some help to you. You require time to create that attractive and in addition real effort to make such a high-quality blog post Learning's from Gavaskar, a cricket legend .